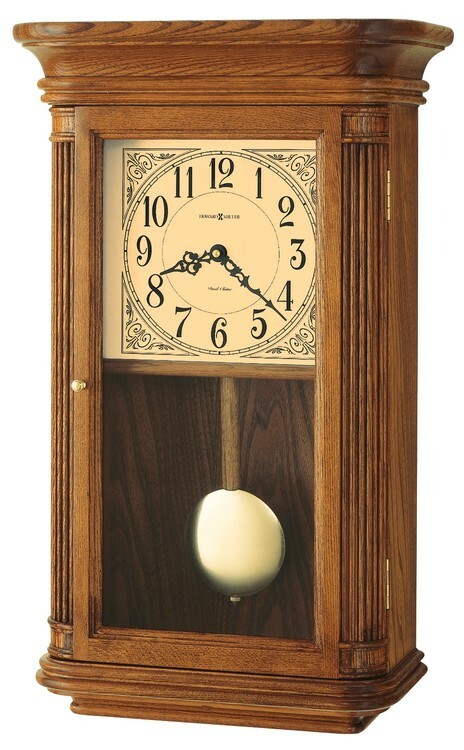 This wall clock features soft, rounded corners on the fully molded base, with a flared, molded bonnet. Reeded corner columns and a polished brass pull enhance the door. The lamb's wool dial features black Arabic numerals, decorative corner accents, black serpentine hands, and glass crystal. A polished brass finished bob on a wooden pendulum adds the finishing touch. 21-1/2" x 13" x 6-1/2"
H. 3/4" x W. 3" Engraved Plate. Dia. 1-1/2" Silkscreen or Laser Etching on pendulum. Contact Customer Service for rush times and costs.